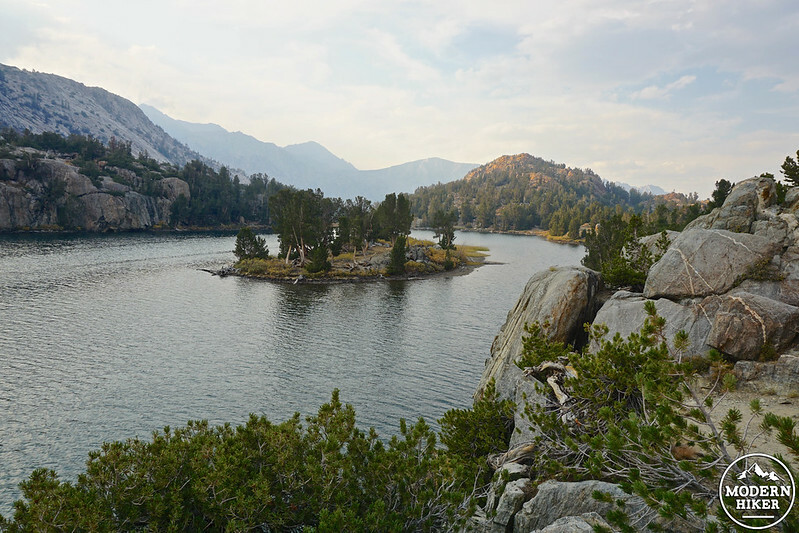 Craving postcard-worthy Sierra views, but don’t have the time (or perhaps, the inclination) to haul a backpack deep into the wilds? 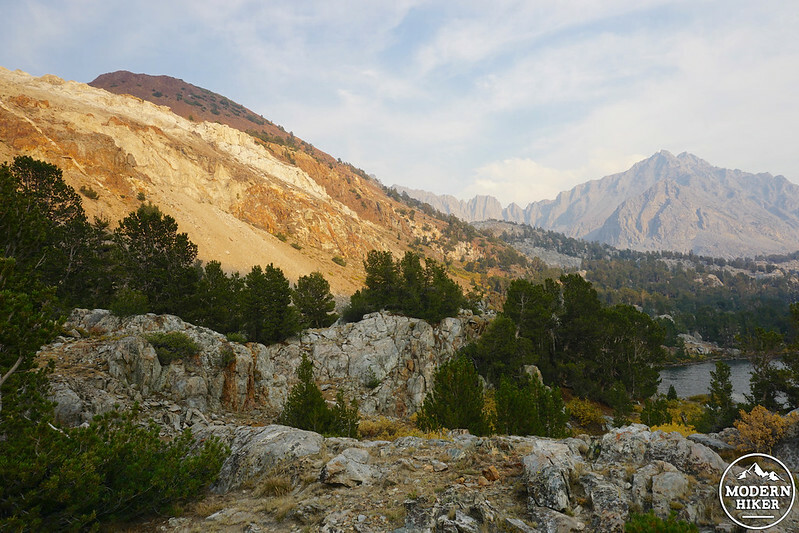 Then you’ll likely enjoy this short, but insanely sweet jaunt to Long Lake via the Bishop Pass Trail out of South Lake, where you’ll find yourself almost immediately surrounded by massive granite peaks and shimmering alpine waters. 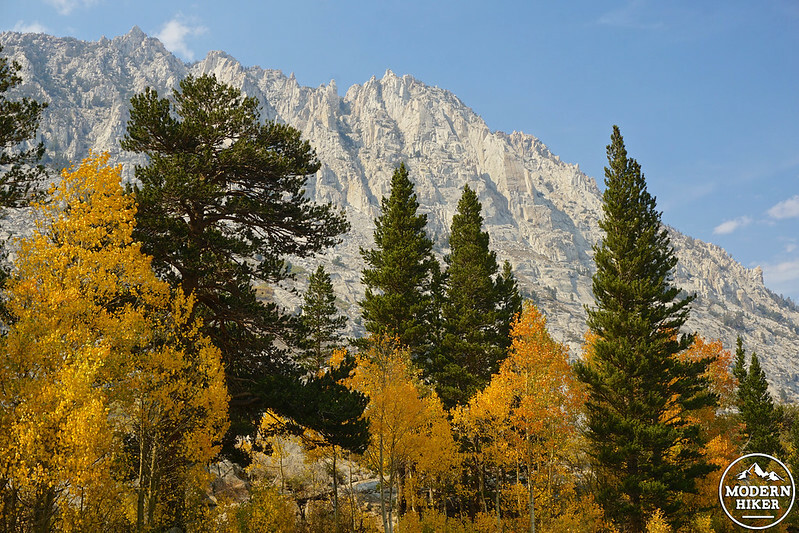 While this area is beautiful at any time of year, it absolutely glows starting around mid-September when the aspens shimmer in an array of golden hues. In fact, the drive up to the trailhead might prove to be just as beautiful as the trail itself if you time it right! Once you’ve pulled yourself away from the roadside attractions, you’ll find ample parking – and bathrooms, bear boxes, a boat launch, recycling, and garbage receptacles – at the Bishop Pass trailhead at South Lake. 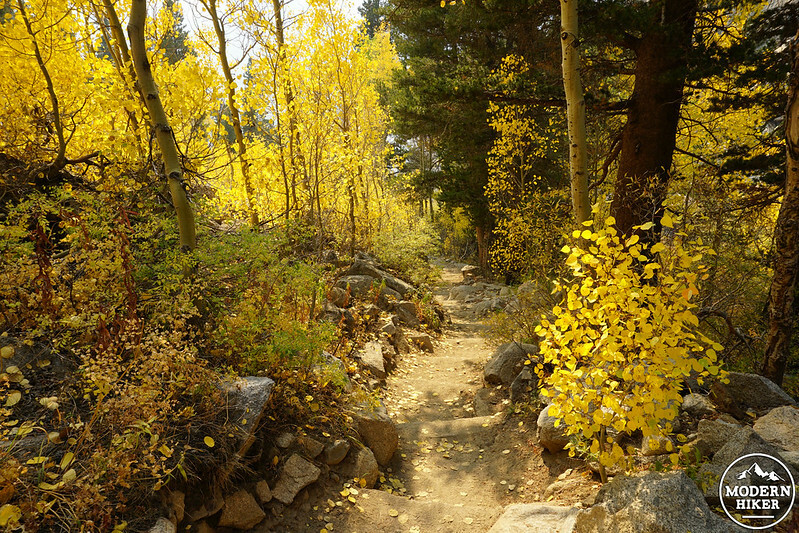 You’ll also find even more aspens as you start your journey just past the information kiosk on the south side of the parking lot. 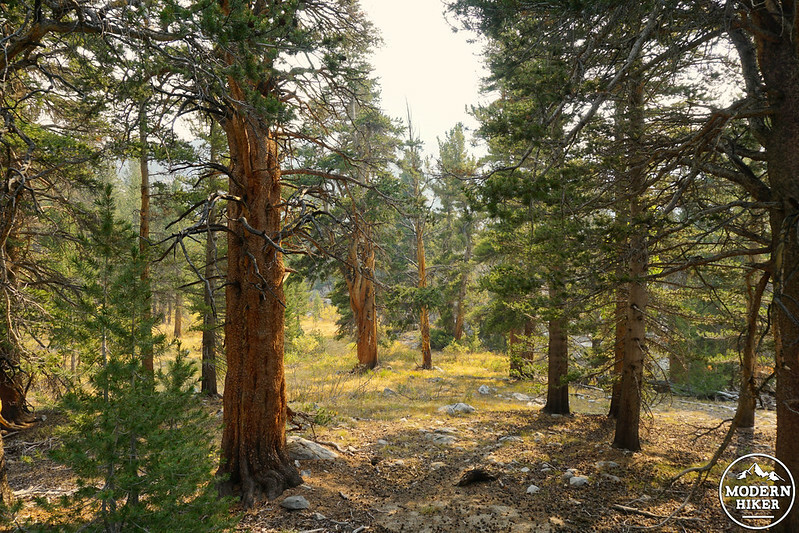 The path wastes no time climbing up – although your destination is Long Lake, the trail follows the South Fork of Bishop Creek to ultimately top out at 11,980’ Bishop Pass, so you won’t see much in the way of downhill until you head back to your car. 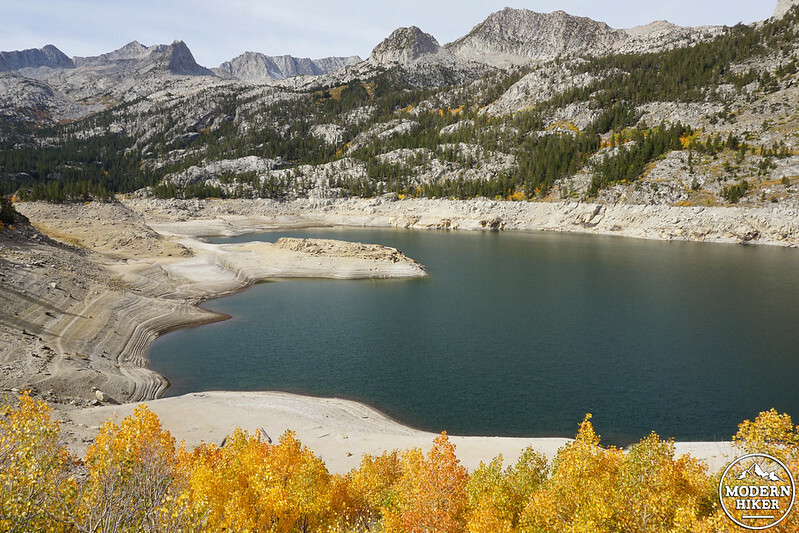 The upside is that you quickly earn views down to South Lake itself (which may appear partially drained at times due to drought and/or flow control by Southern California Edison), and out to the jagged ridgelines towering over the drainage, including prominent Hurd Peak to the south. 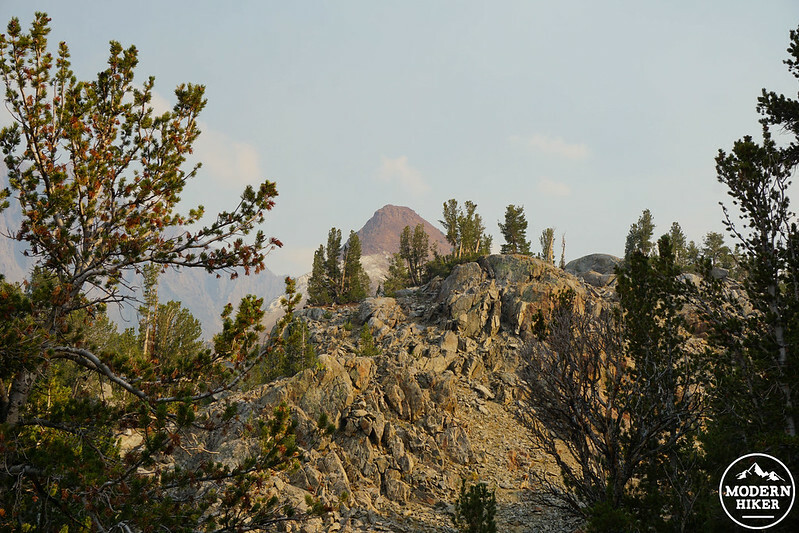 After short, sunny section with fantastic South Lake views, you’ll duck into a shady swath of birdsong-filled lodgepole pine forest, hitting the John Muir Wilderness boundary around 0.7 mile. 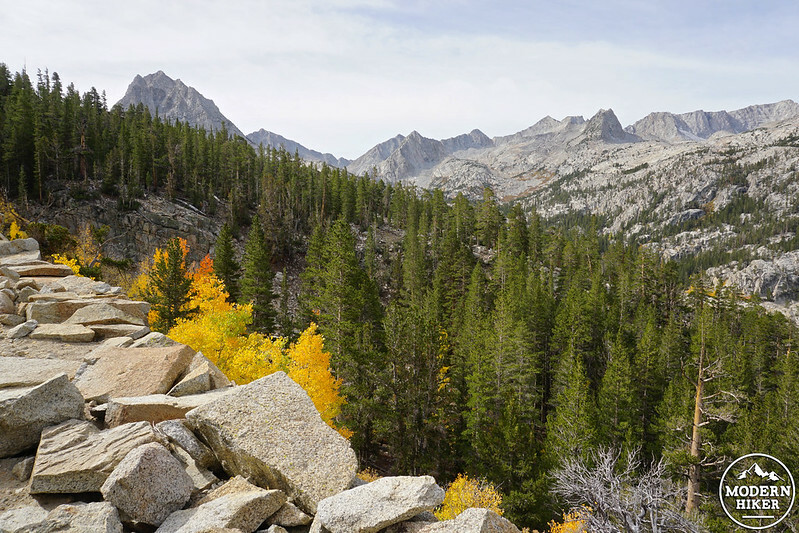 Right after this, you’ll reach the first trail junction – the branch to the right heads towards Treasure Lakes (another worthy fall excursion), but you’ll stay straight towards Bishop Pass, continuing your steady ascent through the gorgeous, sometimes wind-gnarled trees. Just past the mile mark, you’ll cross a small stream via a wooden footbridge – if you need water, you can top off here (make sure you’re carrying some form of water treatment). In the spring and early summer, this meadow-y area positively explodes with chlorophyll – so rest assured that if you miss a fall visit, you’ll still get some vibrant color during other times of year. 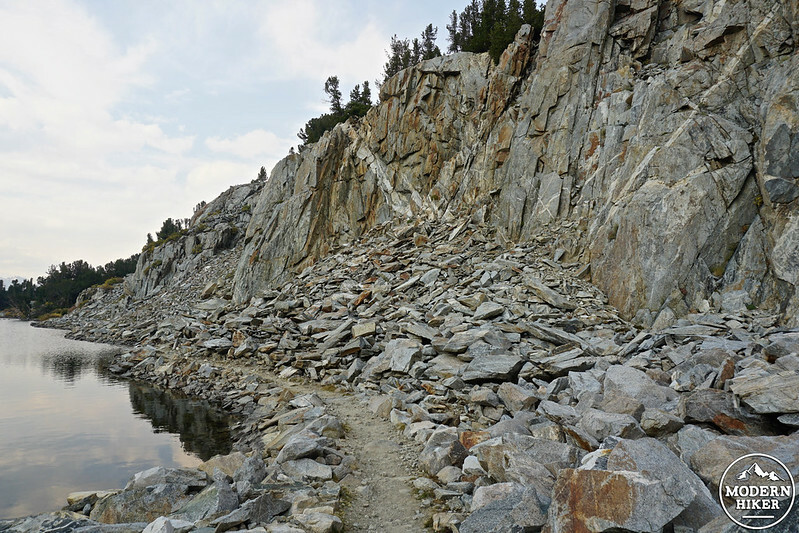 At 1.4 mi, you’ll reach a second trail junction, this one splitting left towards Marie Louise Lakes. Save that trip for another day and continue straight, crossing another small footbridge a moment later, offering another spot to fill up your water bottles. 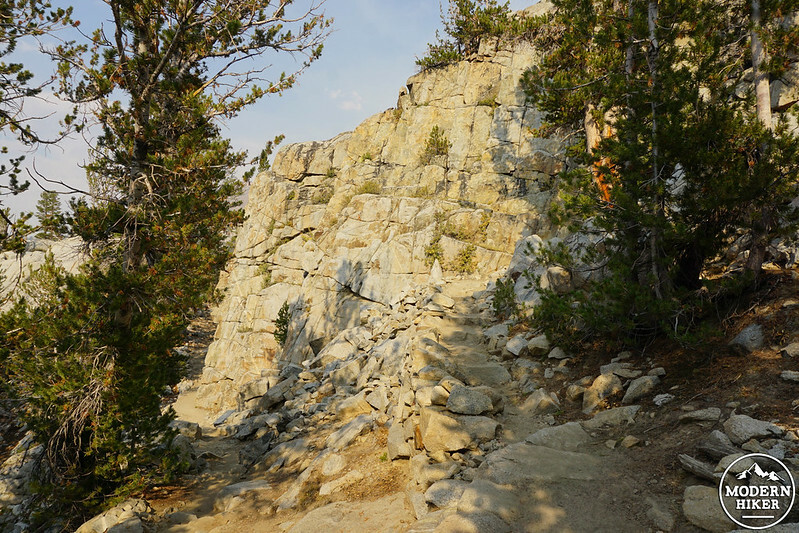 You’ll want to be sure you’re hydrated for this next section, which switchbacks up, up, up through a patch of rather picturesque chunky granite, offering views down to Hurd Lake peeking out far below to your right. From here, the scenery begins to shift from pretty to gorgeous – you’ll catch your first glimpse of a rich brown cone in the distance to the southeast that looks not unlike a giant pile of cocoa powder – this is perfectly named Chocolate Peak, an unmistakable landmark just west of the jagged ridges of the Inconsolable Range that will dominate your view momentarily. 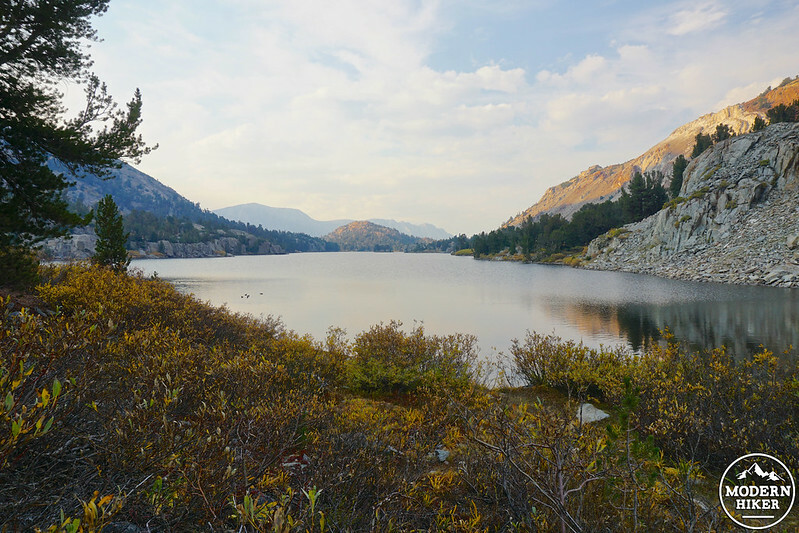 But first, you’ll pass a side trail to Bull Lake and Chocolate Lakes on your left around 1.9 miles, offering the opportunity for a fun detour on a partially maintained path that passes several more lakes and circles the peak, eventually spitting you out along the shore further down Long Lake. Minutes after the trail junction, you’ll reach the Long Lake outlet around the 2 mile mark. Before you cross the outlet itself, however, you’ll likely be stopped in your tracks by the stunningly beautiful sight before you – Chocolate Peak and its colorful benches to your left, the northern cove of Long Lake in front of you, massive Hurd Peak to the southwest, and Bishop Pass guarding the south. If you time it right, this area comes alive in the late afternoon, especially during the golden hour before sunset. Once you’ve picked your jaw off the floor (and snapped at least fifty photos), you’ll continue south on the trail, crossing the outlet via a smattering of small rocks. From here, the trail curves around the eastern shore of Long Lake, where you’ll likely find at least a few people fishing for resident trout. Around 2.3 miles, look for a faint use trail veering off to your right – this leads to a nice vista that offers great photo opportunities, including a chance to snap the island floating in the middle of the lake. 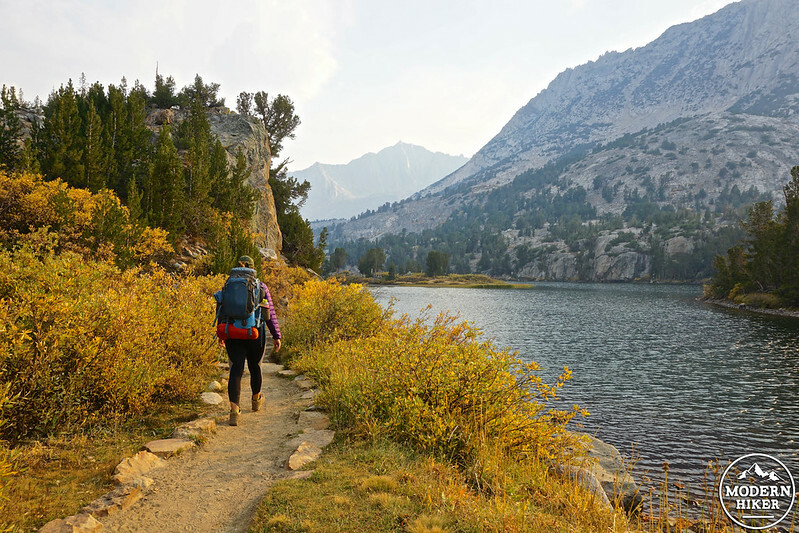 There are actually quite a few social trails meandering around the lake’s circumference – some of these will lead to hidden campsites, but be sure to use your best judgment and adhere to Leave No Trace ethics when choosing a spot if camping (and make sure you have a wilderness permit – you’ll want to reserve in advance during the high season between summer and early fall, since this is a massively popular trail). 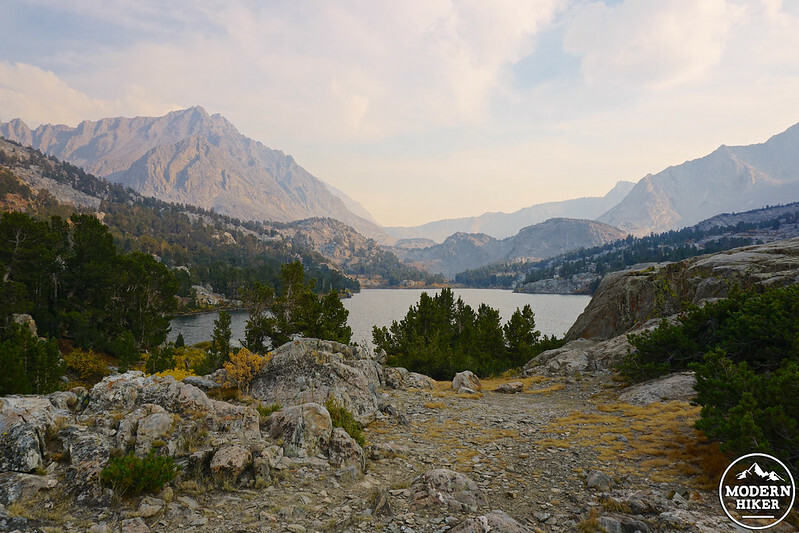 After you rejoin the trail, you’ll head slightly inland (and uphill) and will lose the lake views for a few minutes, but you’ll still have plenty to gawk at given the array of stunning peaks all around. At around 2.7 miles, you’ll reach your last signed trail junction of the hike, the Ruwau Lake trail, which heads uphill on a staircase to your left. This trail will eventually link up with the Bull Lake / Chocolate Lakes trail to form a loop of sorts, but it the section between the lakes isn’t maintained and can be hard to follow; navigation skills are definitely recommended if you want to take this side trip. Your trip (well, the halfway point, at least) ends around 2.8 miles when you hit a footbridge that spans the Long Lake inlet. 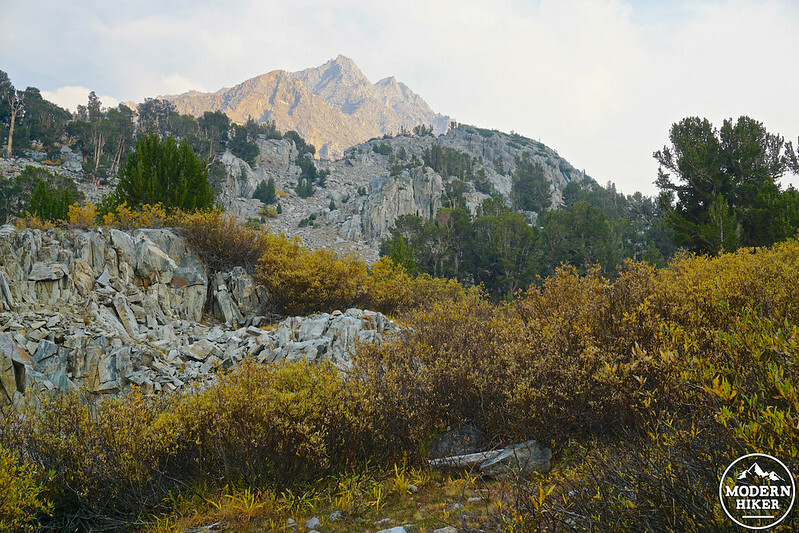 From here, the trail departs the lakeshore and makes a beeline up towards Spearhead, Saddlerock, and Bishop Lakes – and eventually, Bishop Pass. However, if you want to call it a day, turn back and retrace your steps to the trailhead. If you have a wilderness permit, you can find good camping to the west of the outlet by following a use trail along the shore past the footbridge. No matter what you choose to do, definitely spend some time soaking in all of the beauty around you – this is the good life! 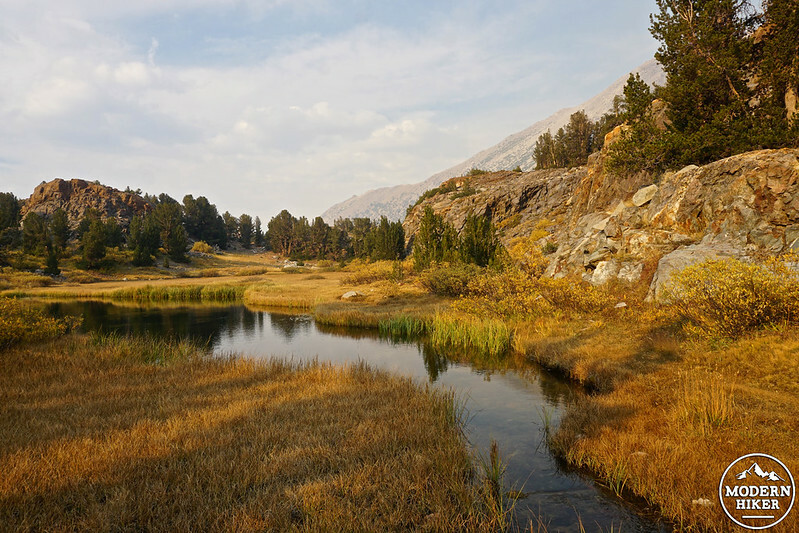 There are several seasonal campgrounds located along South Lake Road and CA-168, the closest being Willow Campground. 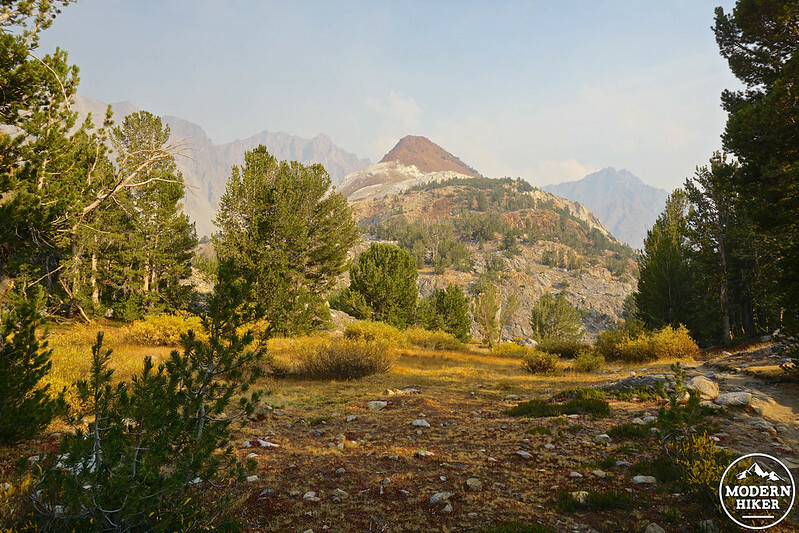 Dispersed camping is allowed in the John Muir Wilderness as long as you have a wilderness permit, which can be obtained at the White Mountain Ranger Station in Bishop, California or by visiting Recreation.gov. 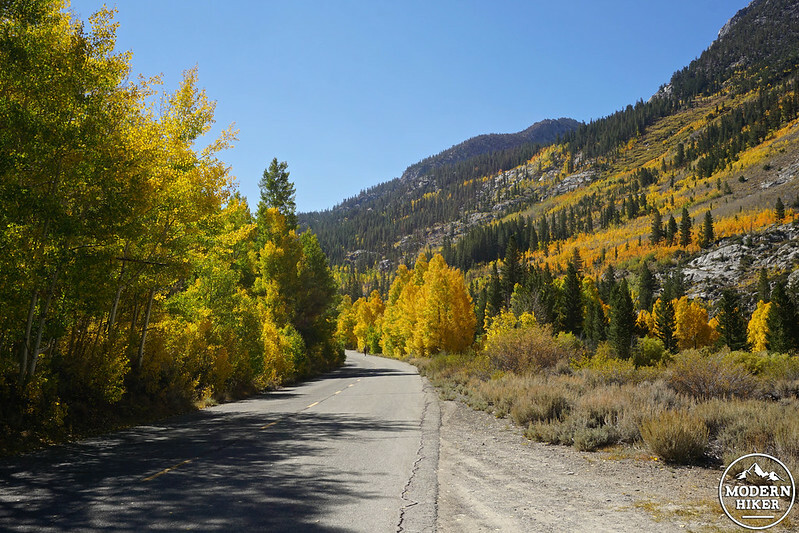 From the town of Bishop, head west on CA-168 for 14.7 miles, then take a left onto South Lake Road. Continue straight for 7 miles until the road ends at the South Lake parking area. The trailhead is next to the information board located on the south side of the parking area. Thank you. This is very helpful. I will let you know how it goes!